With winter coming fast in Dallas/Fort Worth, expect to see higher chances of rain, ice, and possibly snow if we’re lucky (or unlucky depending on your preference). For some, cold winds and frozen precipitation are just general nuisances, but don’t let your concerns stop there. Rain, ice, and snow all have chances of leaking into your home, which if left unattended can cause water damage and mold growth. Although winter is supposed to be a season of relaxation and comfort, don’t let water get cozy inside your home. RestoPros knows that a homeowner should be prepared for potential winter leaks. Our experience as water damage and mold remediation professionals has given us extensive knowledge on how to prevent it in your home, and with winter bringing a higher chance of precipitation, practicing this knowledge will keep your mind at ease during the cold season. Thus, we have provided some tips and guidance on keeping your home free from winter leaks. • Clogged downspouts lead to fast build-up on your gutters as there is no passage for water and debris to escape. • Make sure you clean your downspout before cleaning your gutter, as this allows mud and debris from your gutter to safely flush through your downspout. • Place a water hose inside the downspout from the bottom to flush out any clogging. • You can use a screwdriver to take apart the bottom of your downspout for easier access to clogged areas. • After you flush out and unclog your downspout, reattach any parts you removed and begin cleaning your gutter. • Brisk and cold winds add both excess rain, mud, and leaves to your gutters, and less space for waterflow means water can spill around the gutter and even leak into your walls. • Clogged gutters also begin to deteriorate if left unattended, and prolonged build-up may even cause your gutter to break from being unable to support the weight. • Make sure to practice ladder safety when cleaning gutters: keep ladder legs locked and stable, have someone supervise the bottom, and never go more than three steps from the top. • Clear the debris from gutters using your hands, and use a water hose to flush out mud and other debris. • Be sure to check the corners of your gutters, as they easily become clogged. • If you don’t want to use a ladder, there are gutter cleaning wands that allows you to unclog gutters. • Rain, ice, and snow can enter in through the small cracks of your home, and your door has many openings for unwanted precipitation. • Weather stripping can be bought at your local department store, and is used to seal the sides and bottom of your doors to prevent cold air and precipitation from coming in through the cracks. • Place doormats on both sides of a door to act as a shield from water and mud from shoes and paws. • Equip your door with door bottoms to further prevent water coming from underneath. • Windows have as much potential for leakage as doors, and with more windows in your home than doors, protecting and sealing them is a must. • Weather stripping can be used to seal the sides of your windows, and this will help stop cold air and unwanted precipitation from entering in. • Water resistant blinds and shades are available at your local department store to place over your windows. • Water resistant curtains are available as well, and help add further protection from winter leaks. Never let your home go unprotected from winter leakage. 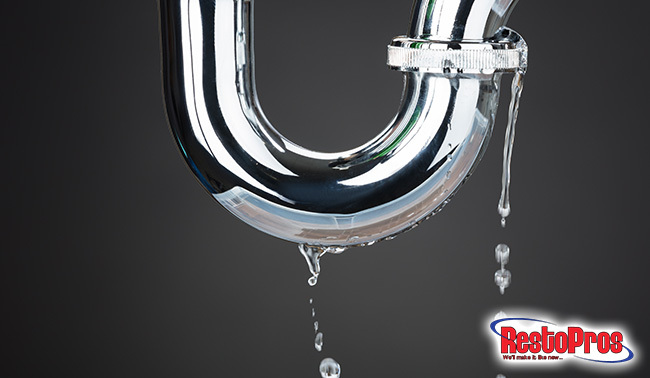 If you are experiencing winter leaks, water damage, or mold growth in your home, contact RestoPros immediately. Our dedication is for a safe home, and we provide expert water damage and mold remediation services to ensure your home stays protected for the winter season. Contact us at 855-587-3786 to schedule an appointment and meet your trusted mold and water experts.